Introducing Xbox One. Watch TV or chat with friends on Skype while you play, and keep on playing while smarter matchmaking happens behind the scenes. With Xbox One, you can snap two things side-by-side on your TV, and switch from one to another instantly. Forza Horizon 4 changes everything. 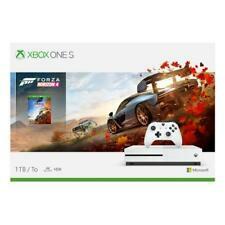 Order the Microsoft Xbox One S 1TB Forza Horizon 4 Bundle, White, 234-00552 and experience a shared open world where dynamic seasons change everything. Join team multiplayer for casual fun or ranked teams to take on the best in the world. Xbox One is a state-of-the-art gaming console, a generation TV and movie system and a whole lot more. Hard Drive Capacity 500GB. Platform Microsoft Xbox One. Model Xbox One - Original. Console Colour Black. New ListingMicrosoft XBOX ONE 500GB Black Original System CONSOLE ONLY! Fully Working!!! 4.5 out of 5 stars - Microsoft XBOX ONE 500GB Black Original System CONSOLE ONLY! Fully Working!!! 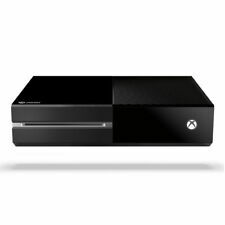 324 product ratings324 product ratings - Microsoft XBOX ONE 500GB Black Original System CONSOLE ONLY! Fully Working!!! Microsoft Xbox One X 1TB Black Console. Condition is Used. Powers on. Reset. No controller. No HDMI. No power cord. Shows signs of use. There are a few VERY light scratches on black base (see pictures). Two of the rubber feet on bottom fell off. Prop 65 Warning WARNING: This product can expose you to chemicals including Styrene, which is known to the State of California to cause cancer, birth defects, and reproductive harm. Watch 4K Blu-ray movies and stream 4K content on Netflix and Amazon video. 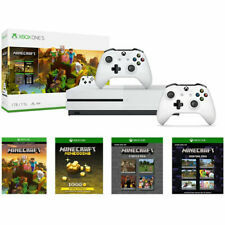 Microsoft Xbox One S 500GB White Console. Controller Is Different. Works Great! 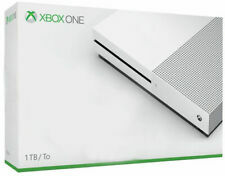 Microsoft Xbox One S 500GB White Console. Controller Is Different. Works Great!. Condition is Used. Shipped with USPS Priority Mail. 4.5 out of 5 stars - Microsoft Xbox One S 500GB White Console. Controller Is Different. Works Great! 415 product ratings415 product ratings - Microsoft Xbox One S 500GB White Console. Controller Is Different. Works Great! Condition is New. Bo x ne ve r op en ed. Xbox One X 1TB Black Console. Excellent like new!!! Comes in original box, controller and hdmi. Condition is Used. 007 Quantum of Solace. Used but works GREAT ! No issues with it. My kids just decided to get another gaming system. Halo Reach. Microsoft XBOX ONE 500GB Black Original System CONSOLE ONLY! Fully Working!!! Microsoft Xbox One S 500GB With Controller and Games. The Xbox One is the third major video-game console developed by Microsoft. First released in November 2013, the Xbox One emphasizes online play, social networking, and cloud-computing features. The Microsoft Xbox One console has a library of more than a thousand games, including the titles Madden NFL, Halo 5, and Call of Duty: Black Ops III. How are Xbox One and the S and X different? The Xbox One S bundle is a slight variation of the original Xbox One design. The console features a 40% smaller case, and it can be set at a vertical orientation. The Xbox One S also supports both 4K-resolution and HDR gaming, but it only works on compatible television sets or monitors that support 4K and HDR technology. Games that output in 1080p can be upscaled to 4K resolution.The Xbox One X is the second update to the Xbox One design. The One was first released in November 2017. Games marketed specifically as Xbox One X Enhanced are designed from the ground up to take advantage of the improved power of the One X console and controller. These games are still compatible with Xbox One and Xbox One S hardware, but when played on the One X console, they will receive graphics improvements that aren't available on the older hardware on the One and One S. In addition, the One X console offers improvements to existing Xbox One games such as a higher resolution or more stable frame rate. Is the Xbox One backwards compatible with Xbox 360? Yes, it is backwards compatible but only with select games. The company adds games to the list of backwards compatible titles, so you should check the list often. Backwards compatibility results in several graphics enhancements on Xbox 360 games, including a more stable frame rate, improved texture filtering, and a more consistent resolution for games with dynamic resolutions. How much storage space is available in the Xbox One? The original Xbox One comes with either a 500GB internal hard drive or a 1TB hard drive. The Xbox One S offers both 500GB and 1TB models as well as an additional 2TB version. The Xbox One X console has a 1TB model. In addition, the total storage space can be expanded with an external hard drive or solid-state drive. This external drive must support USB 3.0 connectivity and be at least 256GB in size. Can the Xbox One play movies and music? Yes, the system supports CDs, DVDs, and Blu-ray discs. The S and X models also support Ultra HD Blu-ray discs.